The perfect map for your next interior design project. Colors are a perfect compliment to many modern decors. 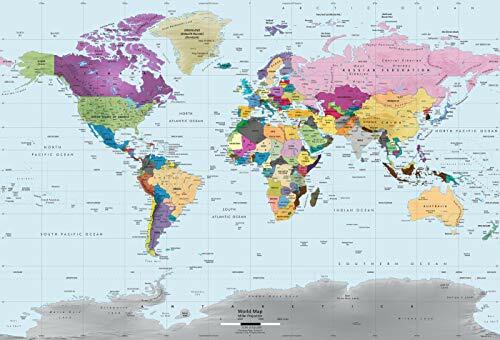 The large, one-piece 53" x 36" poster size map is perfect for a home, office, public lobby, classroom, or even a kids room. The thin, self-adhesive fabric material easily adheres to the majority of interior wall finishes, and once installed, blends in and appears to become a part of the wall! This colorful world political wall map mural illustrates individual countries in contrasting colors making them easy to identify. Gorgeous shaded relief detail featured on the map is derived from SRTM (Shuttle Radar Topography Mission) data collected by NASA. Indicated on the map are major cities, national capitals, rivers, lakes, mountain peaks, U.S. state borders and Canadian provinces as well as latitude/longitude lines. A Miller Projection is used for this map. The map is politically up-to-date with all the latest international name changes up to 2018. Note: Material adheres best to flat, painted walls. Textured walls, walls with eggshell paint, and walls that have been painted 4 weeks or less prior to installation may need testing before attempting to install. EASY INSTALLATION - Simply peel the back, line it up on the wall and stick! PREMIUM QUALITY - Finely woven self-adhesive fabric material will not rip, wrinkle, or tear. DIY DECORATING - Transform a bland room into a gorgeous space you and your guests will love! REMOVABLE - Perfect for apartments! Leaves no residue behind. LARGE SIZE - Decal measures 53" x 36" and comes in 1 piece. Several sizes available! If you have any questions about this product by Academia Maps, contact us by completing and submitting the form below. If you are looking for a specif part number, please include it with your message.